You must make reservations at least 5 minutes in advance of the time at THE BAR at Great Northern Food Hall. The Bar is located in the back of historic Vanderbilt Hall. The Bar is the perfect spot for breakfast, a business lunch or dinner with friends. 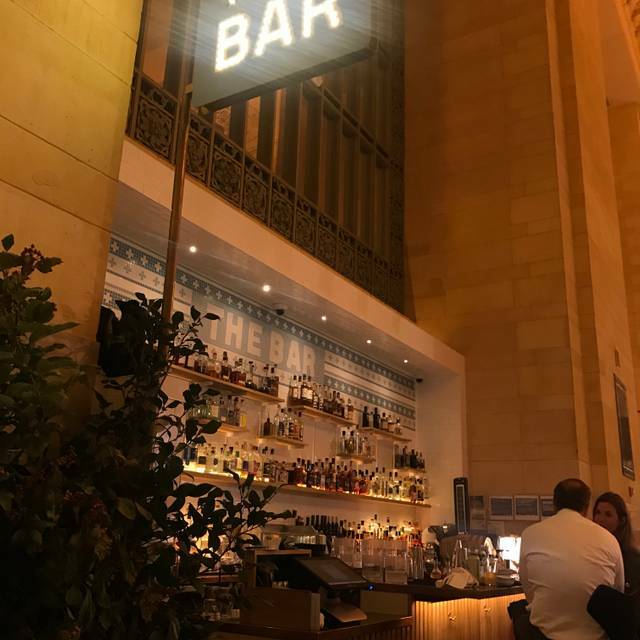 The restaurant offers you a casual dining experience, while set underneath the soaring ceilings of Vanderbilt Hall at Grand Central Terminal. Here the team of chefs prepare the food right in front of you, as you sit around the open kitchen. The Bar offers a rotating menu of elevated small plates, fairly priced and easy to share. For lunch you can also choose selected items from our food hall menu, and in the evening, a selection of delicate bar snacks. Find us in the back of Great Northern Food Hall, we are a destination for foodies and busy New Yorkers alike, a place to grab a quick bite on the go or to share a meal and unwind in an informal setting of Scandinavian hospitality. The server took my drink when I was only 1/2 done and then when I mentioned it she didn’t apologize then brought it back from the dirty dish bin. Horrifying. We went for happy hour. 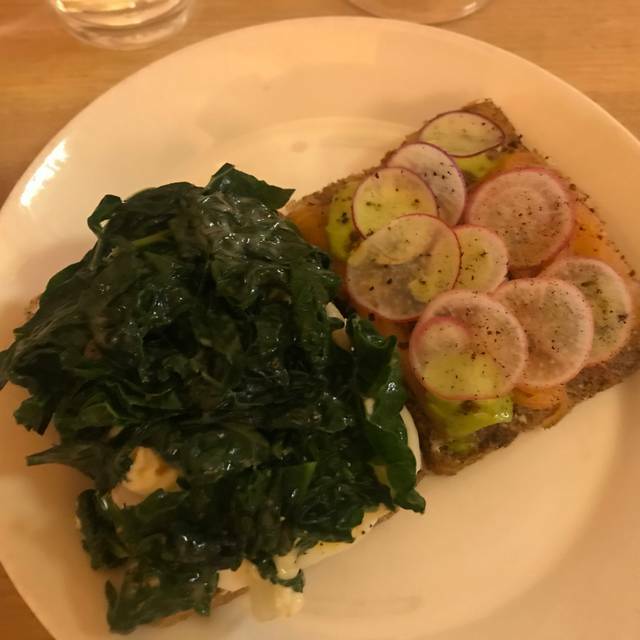 Had very nice tartines and wine. Great spot for a quick nibble and nice wines. Not inexpensive. Even for happy hour, but well worth it. Great service too! The food--grits--was tasty, but it was tepid. Ice tea was oddly bitter. Servers were attentive and pleasant, but got the order wrong, and then again. Not speedy service, either, although I didn't mind. Prices are high for the quality of the food. Reasonable option if one needs to be in Grand Central, but certainly I would never recommend it as a destination restaurant on its own. If you're already at Grand Central, sure, it's OK. Wonderful salmon open sandwich. And avocado sandwich. And a good Chardonnay by the glass. If you are in the area of Grand Central this is really great place to dine. Great value. I had skate wing which I would highly recommend. Pass on the coffee, simply not for anyone who know their coffee. Excellent food. Original and healthy at the same time. Pity the other side of the hall had an event with unbearable loud music! Shame as it spoiled the lunch. This place is not cheap, and still the waitresses were indifferent to me, I had to get up twice to get my order entered, they never checked on me, and I again had to walk to the counter to pay my bill. That would have not bothered me too much in a diner, not in a place where main dishes cost more than $20. Went recently and the hostess was nowhere around. Got seated by a server who was very friendly but would disappear for odd stretches and we had to ask for the check several times. Really want to love this place but it does not make sense to serve a full service restaurant menu (ie the Agern menu) in a cafeteria setting where the service is indifferent. Really hope they’ll figure it out. The food was pretty good and a good value, however it seemed the staff and kitchen was a little disorganized. The wait just to speak to a host was lengthy, the food took a very long time to come out despite the restaurant being empty, the waitress rarely came around to refill water, maybe once, and two of the dishes were missing the chicken component. Additionally, rather than making new dishes, they just served the chicken on the side which was very weird. Why not make a new one? And, how do you forget a main element of a dish, especially when its in the title? This restaurant just makes me frustrated as it has so much potential but is prone to so many missteps. The latest is that they refuse to serve certain of the food hall dishes at the seating area at the back. We realize that customers who eat in cost more so would be ok with their adding a reasonable eat-in surcharge but it’s just insulting when everyone can see the food hall options just outside and not really have them as options. Food continues to be good but when will they realize that they are in a service business and need to give the customer what they want? Generally love the food but so frustrating that they try to restrict the menu and not give you some of the food hall items when you are seated. It’s obviously a blatant push to upsell people to the Agern menu which is just not right for this setting. The fact that salads are not available after 5?6?pm is also so strange. This place has so much potential but their struggle with the food-ambience-value-service equation can make for a frustrating dining experience. It was reasonably quiet at noon on Sunday because there were no commuters, although a fair number of presumed tourists or leisure travelers. Almanak is at the end of the former Vanderbilt Hall so isn't as chaotic as the food stalls at Great Northern--pleasanter for a meal. 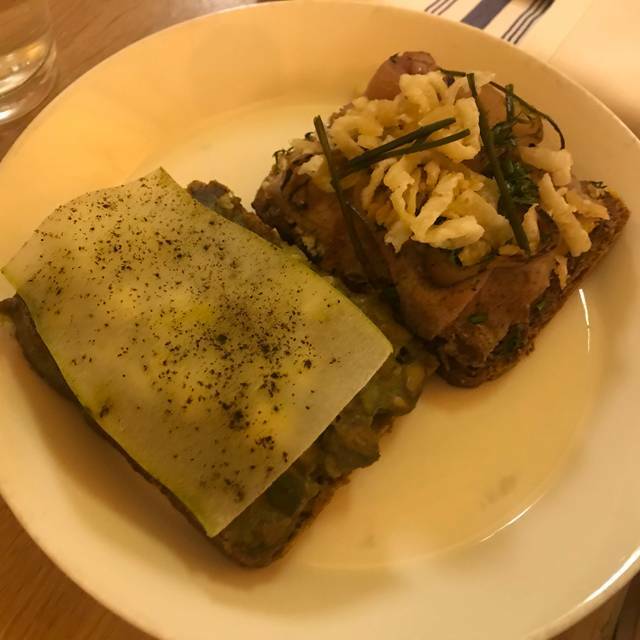 Food was excellent, especially the two items from the smorrebrod offerings from the Great Hall menu. Brunch offering from the Almanak was well prepared, with nice crisp bacon but only one egg. Service was exceptionally slow though courteous. Server did not seem familiar with basic answers to questions about the nature of a particular dish. Value is okay for NYC, but a brunch/lunch for two with "refreshment" beverages--one juice, one interesting juice-based shrub--and no dessert or side dish was over $50. It was very tasty and meet our needs but hard to recommend wholeheartedly based on this specific experience. I am definitely going back! Food was delicious! No host showed up and we more or less had to seat ourselves (despite having a reservation). Food and service were decent but would not recommend the place if you are expecting a usual/ standard restaurant experience. Cafeteria feeling more than anything but again, food and service were decent and would for sure recommend the place, as long as you sort of know what to expect. I like the convenience of the place. I expected more Nordic food, herring, smoked seafood and such. The waiter recommended shrimp with grits and it was a bit far fetched and pricey. A bowl of grits with cheese and a few pieces of shrimp. 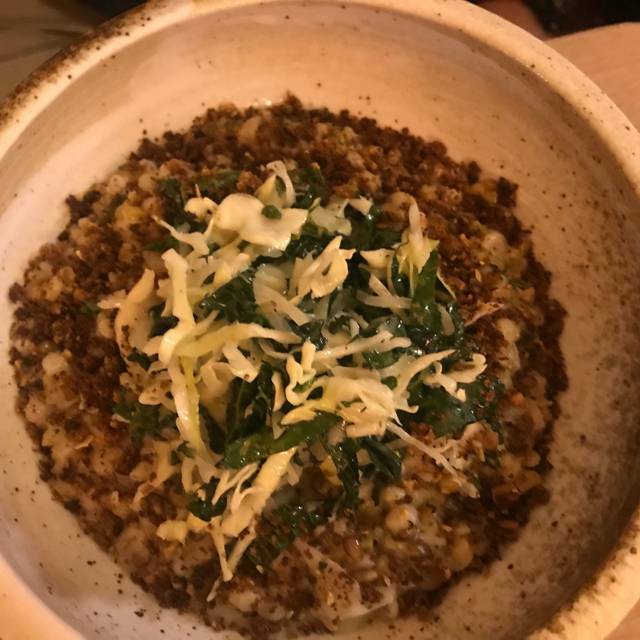 Nothing wrong with grits and the taste was ok. Another day I took herring salad, and found very little herring in the salad but a lot of hard boiled egg and mayonnaise. Nobody showed-up for over 10 minutes at the reception desk and we had to get a waitress attention to get seated (not easy). After 20 minutes without a waiter showing up to get our order we just left and nobody seemed to notice or care. Different. Olive the hostess was wonderful. She was available as much as the server. The food was good, I had never explored Danish food before, but I was quite fond of it. The actual server was just ok.
We were really pleased with our Sunday brunch experience. The food (we ordered the smoked salmon and eggs, and the avocado toast) was just delicious -- flavorful and fresh. We were pleasantly surprised at the ample portion sizes, too. It is a food hall, so not a cozy atmosphere, but being in that grand historic space is a treat in itself. The food is interesting and well prepared; a pleasant place to have a tasty bite and a drink. Terrific food. Secluded location even though it's just a few yards from the busiest sections of Grand Central Station. Amazing and beautiful place - just a little hard to find from the map! lol Food is great, had brunch there. This is my second time dining here and it was ok. The food is good but the service was just ok. It was very crowded and a bit noisy. The menu was not very big but the cheese and meat plate was fantastic. This is a good spot to meet with friends, drink some wine and eat some cheese for a couple of hours. Very convenient if you travel on Metronorth. In the really splendid surroundings of the Vanderbilt Hall at Grabd Central Station, the Restaurant is a gem. We had breakfast before taking the train and it was a great way to start the day. I loved this restaurant when it opened. Recently the food has become mediocre, the bread too big, the lettuce cheaper. The whole dining experience has deteriorated to one of many Grand Central spots. I am so sad, because I thought it was so good when it opened. Greed!!!!! Good Nordic food but you have to be into it. Service is iffy. 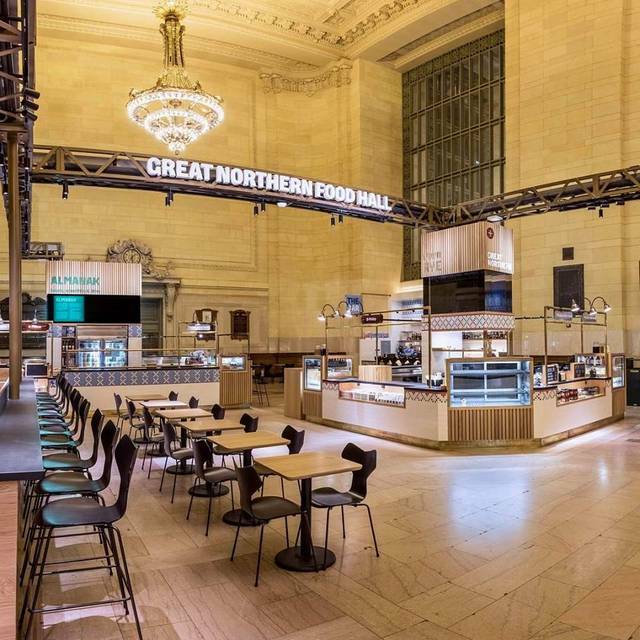 The Great Northern Food Hall is a welcome addition to Grand Central Station. The food is fresh, innovative, and very tasty. It took me back to my travels in Copenhagen. This was not my first visit, but the first time I ate in The Restaurant, which is basically the same food that's available from the food stalls but in one location with a server to bring them to the table. I appreciated that our server was so attentive despite the no-tip policy, and I tipped him in cash accordingly. I would definitely return, and I recommend it for a quick bite or even a business lunch (though it can get noisy at lunchtime).